Ever wonder what kind of letter grade a player might give your letter? Often, it’s just a “pass or fail” situation for collectors. As long as he signed. If there’s an extra or a personalization, that’s extra credit. Well, Jeff Schultz shared this story in January on www.sportscollectors.net. 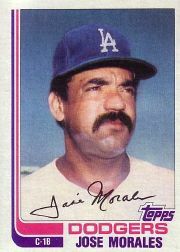 He wrote to Jose Morales, asking for three cards to be autographed. He included two for Morales to keep. Q: What’s your current job title? Where do you serve? How many years service do you have? A: I am a captain. I’ve been in public service since 1987.
like me who complain about a lack of time. Your free time might be far more uncertain! A: Home? Days off? I work 12 hours shifts plus respond on calls after my shift is over. Q: How long have you collected? How much is TTM vs. in person? Who was your first autograph? A: On and off since the 80’s. I do the MWL IP and may do AAA this year. First auto? Willie Hernandez, Steve Dillard and Mick Kelleher. I’ve talked to Dillard and Kelleher about it. Q: What are letters you send like? Do you tell about your career? (By the way, I think you SHOULD. I think it helps to be personal in a letter. Helps the guy understand WHY the autograph is meaningful to you.) Do you ask questions about someone’s career? A: My letters are the same format I’ve always used, just updated my job and age. For tougher ones I send a personal letter, but it hasn’t helped. Q:. I mentioned Frank Tepedino, who became a firefighter after baseball. Have you written to other retired players who are firefighters? Any special responses about the connection? A: There are a lot of ballplayers who come from firefighting backgrounds. Had a 20 minute conversation with Chuck Crim before a game. No real special responses. A: Complete the 1983 Topps baseball set. Thanks, Jeff, for all you do. I hope other humble heroes from daily life aren’t shy about mentioning their careers in letters. Players invent so many reasons not to sign. Let them know who they might be turning down.